Unfortunately the 6th run of Jasper is now sold out. Many thanks to everyone who has bought the kits! Hope your builds are progressing well. I hope to get more stock some time in January – so if you are interested in getting a kit, send an email to info (at) jaspersynth.co.uk with your for shipping. When new stock arrives and is ready to ship, I can send you a Paypal invoice. The 6th run Jasper PCBs have arrived! It’ll take a few days to work through the waiting list, sending out invoices, packaging and posting the kits. So if you’re on the list be you’ll be hearing from me soon. 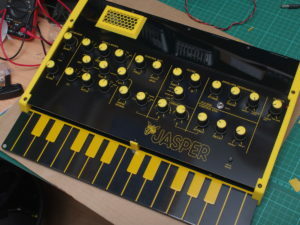 If you’re interested in purchasing Jasper, check out what’s in the kit and send an email to info (at) jaspersynth.co.uk stating where you are so the correct shipping can be added and I’ll add you to the list! BOM, Mouser Project , Construction guide etc. It was great to meet so many Jasper builders at the Brighton Modular Meet 2018 last Sunday. It was my first event like this, so wasn’t quite sure what to expect. I was able to demonstrate using the link port, and a couple of other projects I’m working on. Watch this space! Also got to hold a Gnat Special that was in beautiful condition. Thanks, Steve. Next time, need some bigger speakers and headphones. The little Jasper speaker and my Logitech computer speakers were seriously outgunned by the competition! 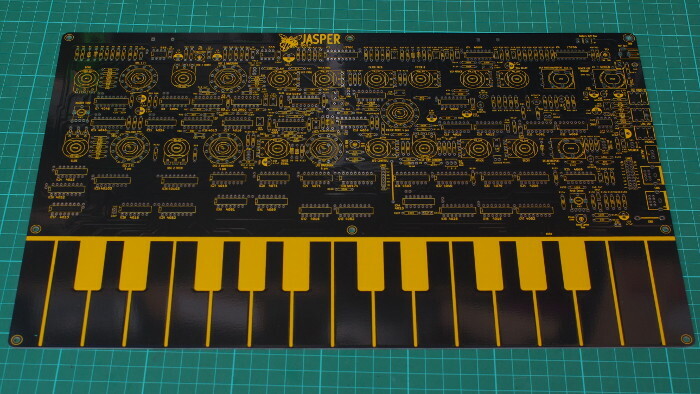 The Jasper kits are currently out of stock – but more PCBs are on order. With luck they will be available in the beginning of July. 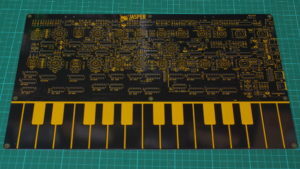 If you are interested in a kit – send an email to info (at) jaspersynth.co.uk and I can add you to a waiting list and will send you a Paypal invoice when they’re ready to ship. Also I’ll be at the Brighton Modular Meet on Sunday 1st July 2018. If you’re there, come and say hi! Finally I’ve documented my 3D printed and lasercut Jasper enclosure. Details, design files and illustrated construction guide are available here. Also kits from the 5th run are still available. See Buying Jasper for details. The fifth PCB run is available! If you wish to purchase a kit, check out the Buying Jasper page for details. Also available is JasperMIDI – an easy-to-build PCB with Microcontroller to provide MIDI input and output capabilities to your Jasper build. Check out the JasperMIDI page for details, construction guide and resources. 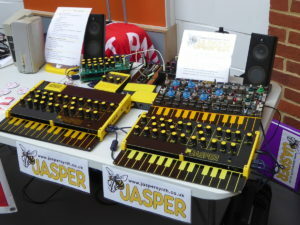 Jasper is a DIY clone of the EDP Wasp synthesiser from the late 1970s and early 1980s. 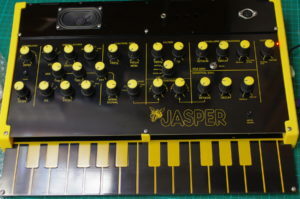 Jasper started as a personal project to build a working copy of the Wasp – and was offered as a limited PCB run on the Muffwiggler DIY synth forum, back in late 2015. The original forum post has grown into a massive thread, and has lead to four PCB runs so far. The build thread’s first post currently has the build guide and other information. I’m amazed at the enthusiasm people have shown. 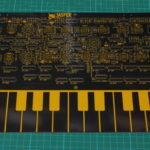 Jasper is only offered as a partial kit – comprising of a printed circuit board, a control panel made from PCB material and the harder to find components. It is not an exact clone – in that some component changes have been made to make it work with transistors and ICs currently available – and a few extra features have been added for convenience. You need to build an enclosure or case for it as well as soldering all the components. This site will host information about Jasper and its associated projects, including the build documentation and tips, and I hope to highlight some of the builds people have made with my PCBs.